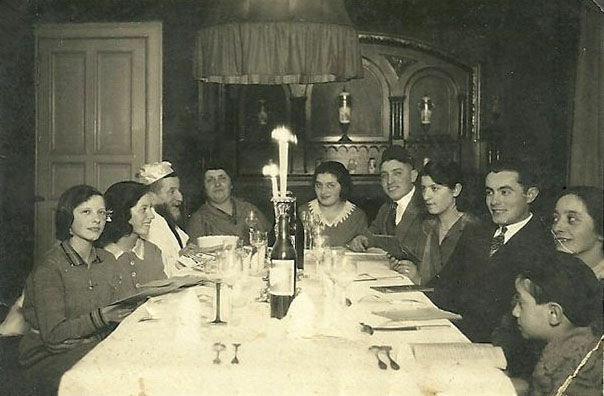 The Steinhardt-Safier family collection contains 28 photos showing the prewar Steinhardt and Safier family life : pictures taken on boat rides during vacations, wedding photos taken at a synagogue in Berlin, baby pictures of Harry Henri Steinhardt, family parties and Passover celebrations, and the Safier family at their bakery in Berlin. The collection also contains a post-war letter from the Belgian Ministry of Public Affairs confirming the deportation of the Steinhardt-Safier family and two family trees clarifying the ties between the Steinhardt and Safier families. Family edition, 65 copies. Kazerne Dossin library : 6717. The book also includes a genealogy of the Steinhardt and Safier families. Berta Steinhardt was born in Berlin in 1911. She married Kasriel Rechtschaffen there in 1937. The couple and their baby daughter were able to flee from Germany to Denmark in 1939, where a son was born in 1942. The Rechtschaffen-Steinhardt family eventually made it to Israel. Berta Steinhardt-Rechtschaffen stayed in contact with her brother Menasche Steinhardt (b. 08/01/1906 in Tarnobrzeg, Poland) until 1942, sending letters and postcards to Belgium. Menasche, his wife Eidla Edith Safier (b. 02/06/1910 in Tarnobrzeg, Poland) and their son Harry Henri Steinhardt (b. 25/06/1938 in Berlin, Germany) had fled from Berlin to Antwerp, Belgium, in 1939. All three of them were deported from the Dossin barracks to Auschwitz-Birkenau via Transport XII in October 1942 and were murdered in the Holocaust. Berta Steinhardt-Rechtschaffen researched the fate of her brother for the rest of her life. Her granddaughter Ruhama Bonfil and her great-grandson Noam Corb continued Berta's search after her death in 2004. The Steinhardt-Safier family collection is the result of the research done by Berta Steinhardt-Rechtschaffen, her granddaughter Ruhama Bonfil and great-grandson Noam Corb. They collected all documents regarding the fate of Menasche Steinhardt, brother of Bertha Steinhardt-Rechtschaffen, and his family. The collection creators were also able to contact the surviving family members of Eidla Edith Safier-Steinhardt, wife of Menasche Steinhardt. The Safier family had in its possession photos, sent by Margot Maria Safier-Weitz, sister of Eidla Edith Safier-Steinhardt, from Berlin to Safier family members in Denmark. These items were then added to the Steinhardt-Safier family collection.